President Moon Jae-in on March 21 chats with bankers at the Seoul headquarters of Industrial Bank of Korea ahead of his announcement on regulatory innovation for internet-only banks. 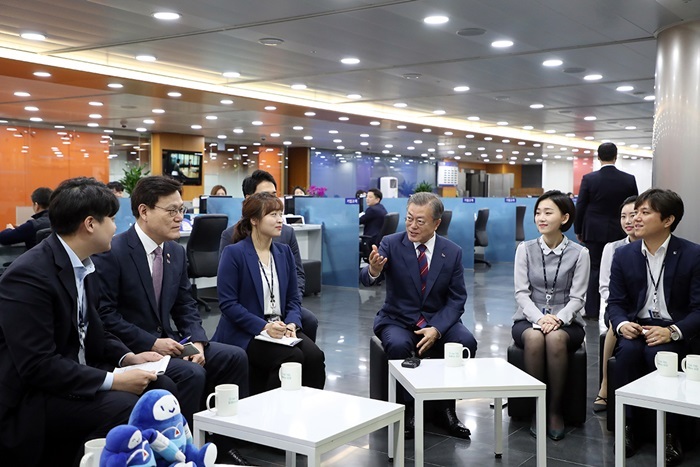 President Moon Jae-in on March 21 announced his vision for innovating the financial sector and fostering new industries at the Seoul headquarters of Industrial Bank of Korea. “Regulatory innovation for virtual banks is part of the process to allow innovation while firmly abiding by the basic principle of separation between banking and commerce. This will be a new example of innovation in regulatory methodology,” he said. Some 110 professionals from startups, publicly listed companies and financial businesses came to hear the president speak, followed by a discussion. Mentioning innovative projects by global internet heavyweights like Amazon, Facebook and Google, the president announced plans to innovate loan systems to provide KRW 100 trillion to small- and medium-size companies designated as leading innovation. President Moon Jae-in on March 21 announces plans to implement regulatory innovation for virtual banks at the Seoul headquarters of Industrial Bank of Korea.